Last year, before I had my own blog, I wrote a guest post on AJW’s site about my obsession with the Western States 100 (see post). I wrote about my inadvertent inauguration into the event in 1978 while camping down on American Canyon Creek with my brother — how these tired, dirty runners kept coming by asking where the aid station was, a question to which we had no answer. From that first night, I was hooked — well, obsessed is more like it. I’ve been consumed with the race, the course, the characters and all the rich history in the region ever since. I love the training leading up to the event each year, the predictions, the preparations and, of course, I especially love race day itself and the over 1,300 volunteers filling every need of the 400 runners. If you’ve read this far and seen the post I wrote and still question why I’m obsessed with the event, then you probably just won’t ever get it. There is one thing I didn’t write about in that post last year and it may be more significant to me than anything else. It’s not necessarily a source of my obsession, but something much less tangible. It’s difficult to describe without sounding too corny — something that transcends our individual participation in the event. I’m talking about the connections that form with people as a result of the race. The relationships and bonds we find ourselves in without conscious effort. I’m thinking of both smaller sub-groups that are formed at aid stations, training groups, or during the race itself, and also the bigger WS family. What’s the family? As Shannon Weil, V.P and Co-Founder of WSER, says, “The WS Family is simple to join; it includes anyone who has ever been moved by the spirit of the Western States Run or the Western States Trail Ride.” That sounds like heavy stuff. And, well, it is. My first introduction to this spirit was early in the ‘80s when I met Judy and Luke Rinehimer. 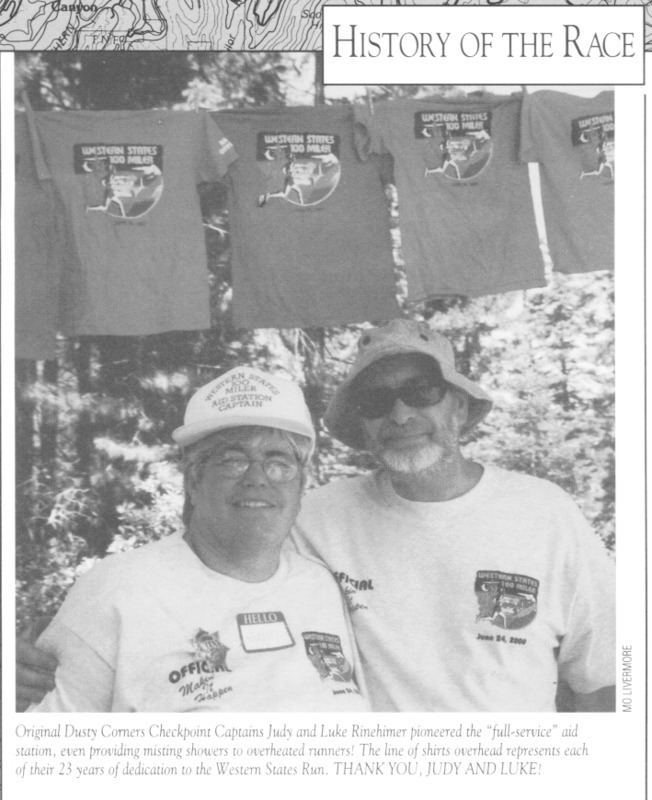 The Rinehimers worked at WSER for over 25 years, including 23 years as aid station captains at Dusty Corners. Judy and Luke are “not runners, never have been, and never will be — at least not in this lifetime,” she says. Living in Cool, they had friends on the Tevis board who asked them to help with the run. After a couple of years of doing simpler jobs, they soon became captains of the Dusty Corners aid station and recruited help from friends in the community. My mom and Judy played bunco together, which is how my brother and I ended up working there. I wouldn’t see these people at any other time of the year, but each WS race day we’d join together and pick up where we left off. It didn’t feel like a year had passed. It was like we had seen each other just the day before. I remember laughing, joking, helping runners, giving the runners the Dusty Corners shower — old timers will remember those — a job Judy describes as “coveted by many of our crew, especially when it came to female runners!” Since my brother and I were the “runners” of the aid station, we were the most likely to actually run the race, but it took us over a decade. When I finally entered the race for the first time in 2001, Judy and Luke had retired. Judy recalls, “We never saw the start of the race until we retired and came to Squaw Valley to watch YOU run. We ‘chased the race’ that day and caught you at Michigan Bluff, Bath Road, Foresthill, Green Gate, 49 Crossing, and the finish line. We were like proud aunts and uncles, telling everyone we knew you when …” Thanks Judy and Luke — I’ll treasure the days at Dusty Corners in my memory forever and hope we can all get together again at the race. After I started running the race in 2001, my connection to the race changed. After Way Too Cool a few years ago a group of Oregonians were running in Michigan Bluff. When we got done with our run, my wife was having a glass of wine with Carol Hewitt, a 4-time WS finisher (’81, ’83, ’91, ’92) and owner of the house on the corner where the aid station is. An immediate bond was formed. Of course there was a lot of talk about WS — both the run and ride. 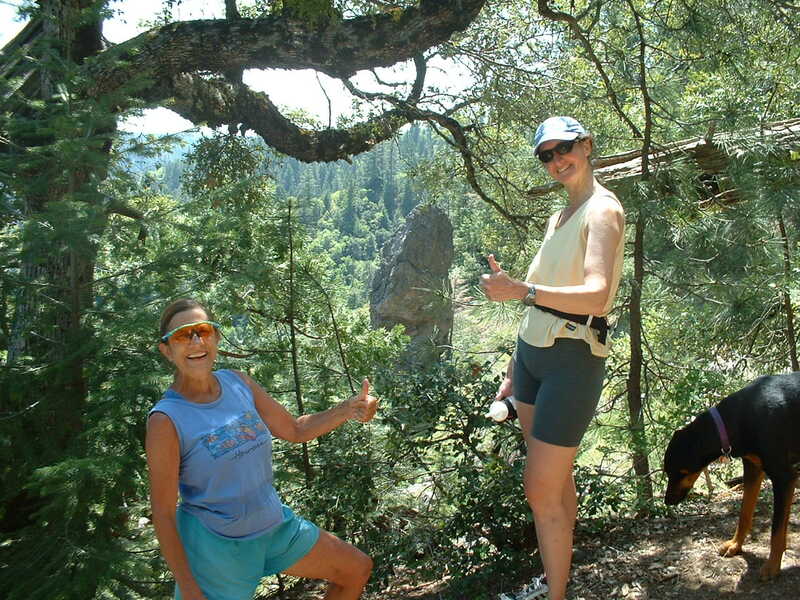 Carol and others in town were so welcoming and open because we were runners — WS runners. Perhaps the best way to understand the spirit of the WS family is to go to the annual Flag Raising Ceremony on Thursday before the race. Walk, run, or ride the tram to Watson’s Monument at Emigrant Pass. I’ve been going since 2001. 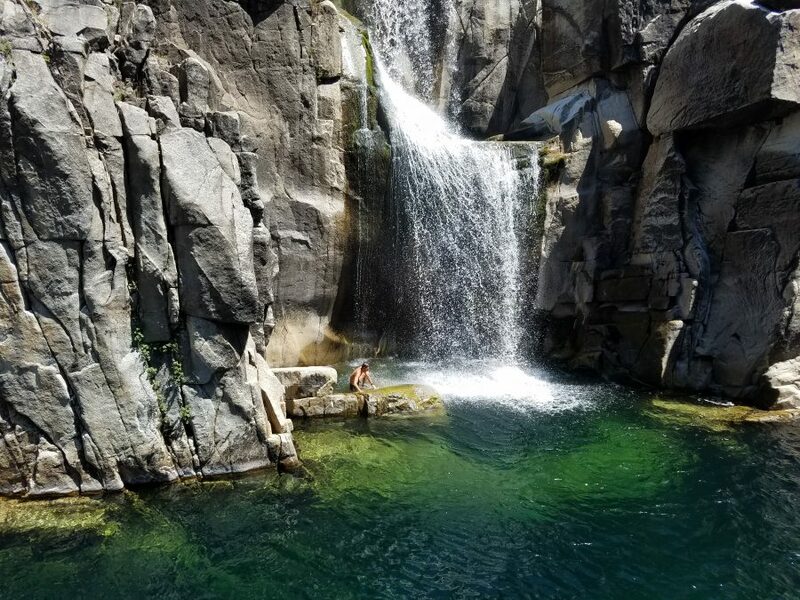 The brainchild of race co-founders Shannon and Mo Livermore, and past-president Tony Rossmann, the event was initially intended as a way to enjoy the views and grandness of the Sierra, but the ceremony has grown to be much more than that. One special thing they do at the ceremony is recognize those in the WS family who have passed on. Most years I don’t know the people, but it’s still touching to hear about them and their connections to the race. Sometimes I wonder whether anything would be said about me if I died. I would hope someone would at least make a top ten list and make everybody laugh. That is an outstanding post! Thanks for writing it. It is amazing just how significant that evening was for both of us (camping at American Canyon Creek back in ’78). Those skinny little dudes with dirt all over their legs really had a contagious energy about them. I was only 9 years old but could really sense the magnitude of their journey. Thanks Craig. Sweet to see your soft side, not only your sarcastic side. Out of 5 of you guys on synchroblog Scott got “score” lowest because it’s not personal to him – not yet anyway. No matter how good a writer is, the subject got to be lived through. I am going to have to leave comments on each of your sites?? Man, lots of breaks today:) Just in case I won’t get around, though, have to admit that a few days ago I started leaning towards driving through “WS100 race” on my way to Silverton. This blog release confirmed this idea. I miss thus bugger. This writing sure brought back a lot of good memories when we all started chasing the race Craig. Wonderful opportunity to hang out with Judy, Luke, and all the volunteers at Dusty Corners. Good memories and still more to come. Thank you Craig (the good son). It has always been a very special event to this family. You guys put the synch in the synchroblog – nice. Thanks for making it part of my life too. Kathy wrote a great comment but she put it on different post. I’m taking the liberty of pasting it here. Thanks Kathy! I found your blog today. It was great reading the quote from Carol Hewitt-I was one of those 1980’s runners who formed a friendship with her and Rich. I hadn’t seen them for more than 20 years when, in 2007 while on a training run on the trail, ran into them, along with Ann and Carl. It was as if no time at all had gone by. I was training for States after a 22 year break (I was a finisher in 1981, 1984 and 1985) and something possessed me to go out there again for an attempt at #4. Carol and Rich were so encouraging to me and were out on race day to cheer me (and everyone else) on. I ended up finishing (barely) in 29:43 but it was the best finish of all! Loved every word! Truly, there is something so incredibly magical about WS that is so hard to explain. And you nailed it. It’s the western states family for sure. There are no better people! It bring runners, non-runners and aspiring runners together year after year. The excitement in the air with this event is so powerful! It’s easy to get hooked. Thanks for writing from your heart!